Sometimes your bathroom does not need a major overhaul, it simply needs a small makeover that can even be done yourself to give it that fresh, updated feeling that you desire. If your bathroom is starting to feel old and dreary, try restoring the bathroom vanity as part of your bathroom remodeling project, you might be surprised at the beautiful outcome. Restoring a bathroom vanity is much easier than it sounds, with a few simple steps you can have a gorgeous vanity that looks brand new and brings a whole new look to your bathroom. Before you start your vanity restoration it is important to prepare your vanity. Ensure that the vanity is free from dirt or grime by wiping it down with a mild soap and be sure to completely dry it. It is then necessary to remove all hardware and decorative accessories so that you do not get any paint on them. For a completely new look, it is fairly inexpensive to replace all of the hardware with new hardware, giving your vanity a brand new style. After your vanity has been prepared, it is time for inspection. If you find any gaps or cracks, they should be sanded down and filled with putty. Allow the vanity to completely the dry and proceed to sand down the entire vanity. Sanding your vanity down is one of the most important steps in restoring your bathroom vanity because it ensures that the primer and pain will adhere to the vanity, giving it the look that you desire. After your vanity has been prepared for restoring, it is time to decide how you want to finish it. Typically you have two choices – painting it or applying a varnish or stain. Painting your vanity will give it a comfortable feeling, while staining or varnishing your vanity will give it a more formal look. If you wish to paint your vanity, start with a primer. You can judge for yourself if your vanity needs one or two coats of primer; make sure to allow plenty of drying time in between each coat. Once your vanity is properly primed, you can apply your coat of paint. It might take a few coats to get the exact color you are looking for. 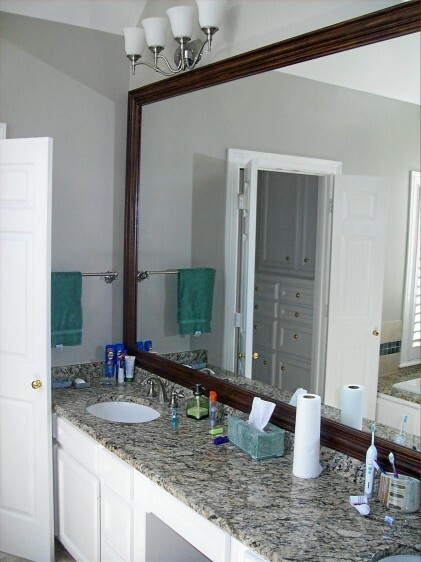 If you choose to stain or varnish your vanity, it is important to first strip the existing stain. There are plenty of commercial stain removers available, it is important to follow the instructions on your particular varnish very carefully. After stripping the existing varnish, you can apply your chosen varnish. After it dries make sure to finish up with a coat of polyurethane. Once your vanity has the color you desire – it is time to put the finishing touches on it. Your local hardware store will be able to offer you a wide variety of hardware selections to fit your vanity. Pick the hardware that suits the style of your bathroom and attach them. You now have a gorgeous new vanity without going over your budget.